Like a latter-day Mr Chips, Des Giffin has been observing some of his star pupils during the Dubai Duty Free Irish Open at Portstewart. Most remarkable of all was to see virgin duneland that he played in as a child, being negotiated by some of the world's finest tournament golfers. "I went to the first-tee during yesterday's pro-am, in the hope of seeing Rory (McIlroy) up close," he said. "But the crowds were so great that I couldn't catch even a glimpse of him. But I did see his father, Gerry, who seemed pleased with the fruits of his son's labours as tournament host." Giffin, a retired schoolteacher from the Coleraine Institute, then disclosed a remarkable distinction. "Two of my pupils, Graeme McDowell and Ricky Elliot, were involved in winning the US Open, one as a player [at Pebble Beach in 2010] and the other as a caddie. It's quite a distinction for the school." As it happened, Eliot, who hails from down the road in Portrush, guided Brooks Koepke to victory in the US Open at Erin Hills, Wisconsin, last month. And home this week on a busman's holiday, he joined the throng at the Irish Open, where he caddied for financier Dermot Desmond in McIlroy's group in yesterday's pro-am. "Out of the blue, he came over and remarked, 'Good to see you again'," said Giffin. "And, of course, I was delighted to see him." The one-time teacher then expressed the hope that Elliot had been well rewarded at Erin Hills. When I assured him that he would have received at least $200,000 as the caddie's percentage of the winner's cheque of $2m, he seemed genuinely pleased. McDowell also talked affectionately about his days at Coleraine Inst, and of Giffin's influence on an academic career which progressed through Queen's University Belfast to the University of Alabama at Birmingham, on a golf scholarship. Meanwhile, Giffin's third pupil has become the focus of attention for an entirely different reason. As a four-handicap greens convenor at Portstewart, he gained the distinction 30 years ago of being charged with the re-design of the Strand Course, where the Irish Open is currently being played. "I'm finding it hard to think of these top players actually testing my handiwork," he said. 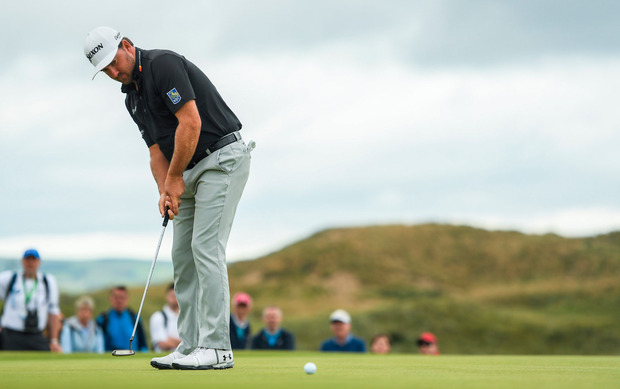 Still, Padraig Harrington is among those challengers who rates it highly, describing it as a 'really enjoyable course'. Indeed he went on to talk about the spectacle of the front nine, where Giffin did the majority of his work in designing new holes from the second to the eighth. "My favourite hole on the course is the sixth, the little par-three. The simplicity of it. A fanstastic golf course. There are a some spectacular holes on the front nine, which has a flow to it. And that is obviously a great compliment to the designer." All of which is reminiscent of the 1996 Open which went to Druids Glen for the first time. That was when Pat Ruddy experienced similar anxiety to Giffin, before receiving a resounding endorsement from an elite field, notably the winner, Colin Montgomerie.